Everyone wants to have his/her own a blog site or a website. Some want to write about technology like me 🙂 , some have a passion for writing about the health remedies, own poems, motivational, inspirational, explorational stuff. The Web is the best place where you can explore your hidden talent. But most of them stuck with the question “How to start a blog?” If you want to get online with your own blog site or a website, you are at right place. Here through this article, I am going to tell you how to start your free website or a blog. There are two famous platforms i.e. 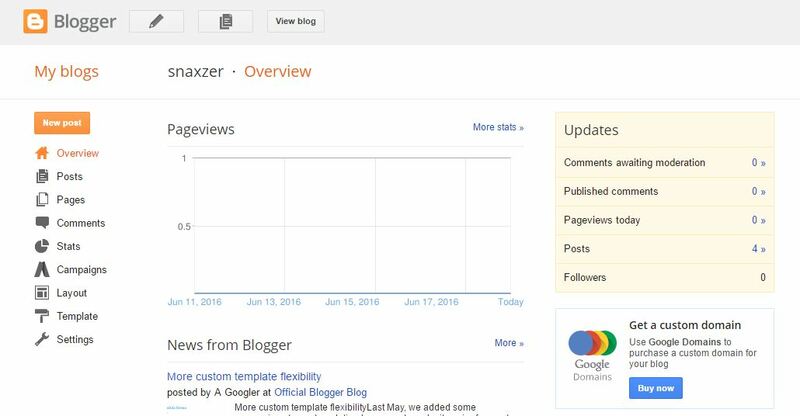 Blogger and WordPress to start your free website or a blog. The service Blogger is hosted by Google itself whereas the WordPress service is provided by Automattic. Most of the people start with the blogger as its very easy to start. To own a free website or a blog over Blogger you need a google account. To create a free website or a blog with blogger just follow the simple steps given bellow. Open any web browser of your choice and navigate to www.blogger.com. Sign in using your Google account username and password. If you don’t have Google account, create one using create account link provided below the login form. 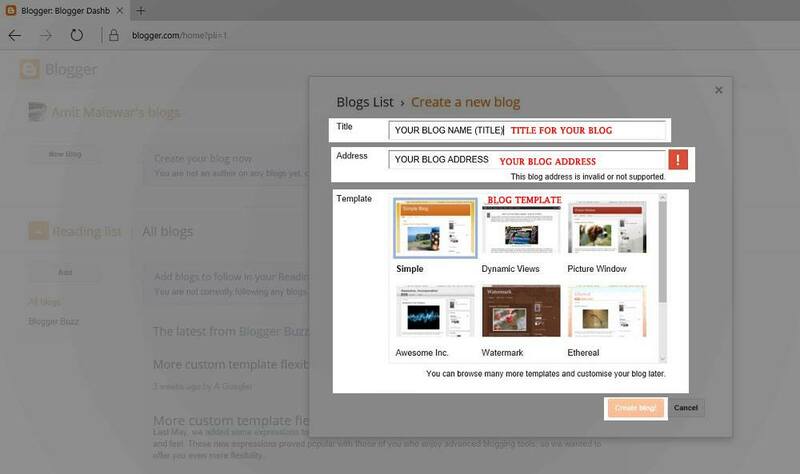 A pop-up screen will appear where you have to write your blog or website title in first text area as shown in below picture. In the second text area, you have to provide URL (web address) for your blog. From template section, you can choose any template. Once you done with all fields create blog button will activate. Note: You can change your blog URL, Blog Title or a template anytime. You can also use a custom domain like yourwebsite.com and custom Template. Once you created your free website or a blog, you will get below the dashboard. 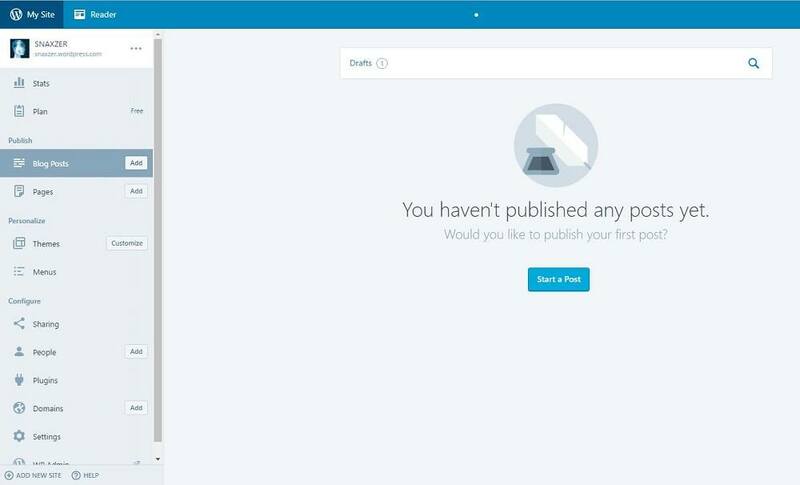 From here you can write your first article using post tab on right side. You can add pages like About us, Contact us using Pages tab. The picture below shows short introduction to writing your first article. 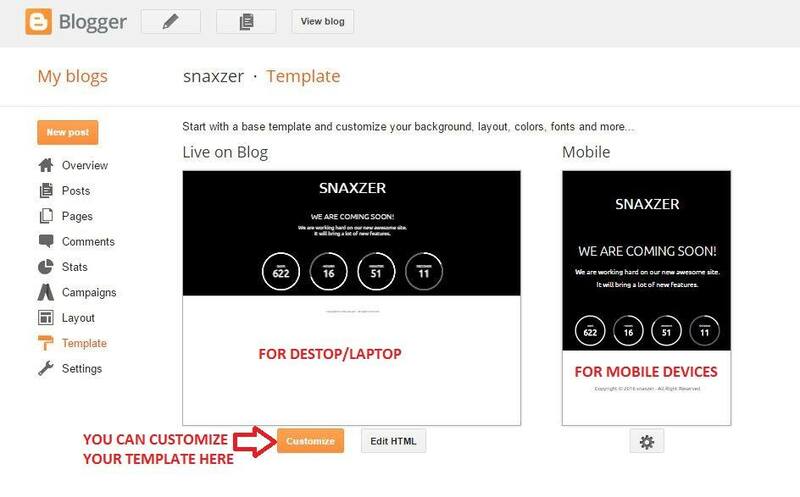 The template customization can be done using the template setting see image below. 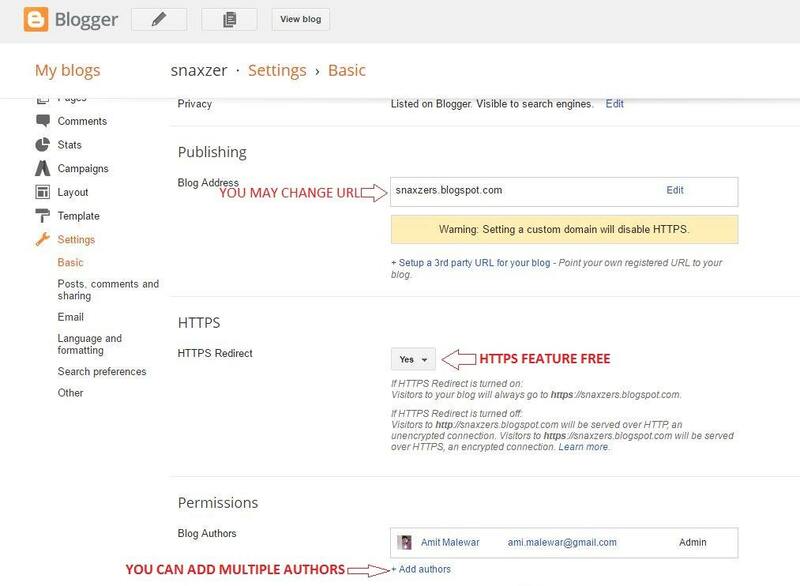 You can make further changes like changing your blog URL, adding SSL, adding multiple Authors or admins. from the setting tab shown in the image below. So this is all about the starting your free blog on Blogger. You will see the window shown in the picture below. Enter your domain name it will suggest you available domain names. 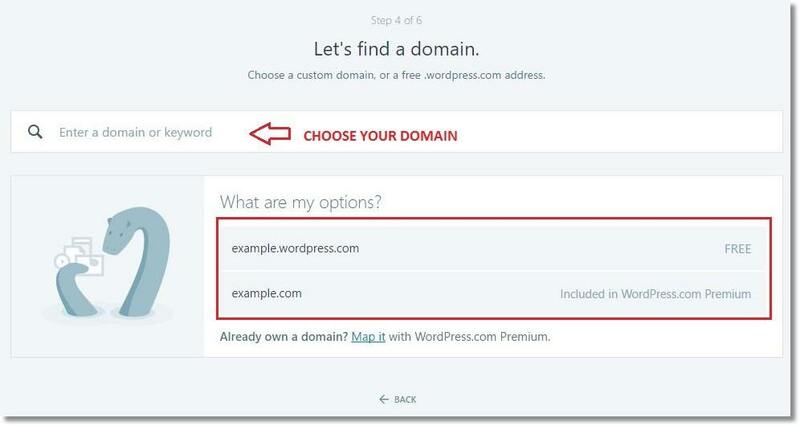 Here you have to select the domain name followed by wordpress.com which is only the free option. Refer the below picture. 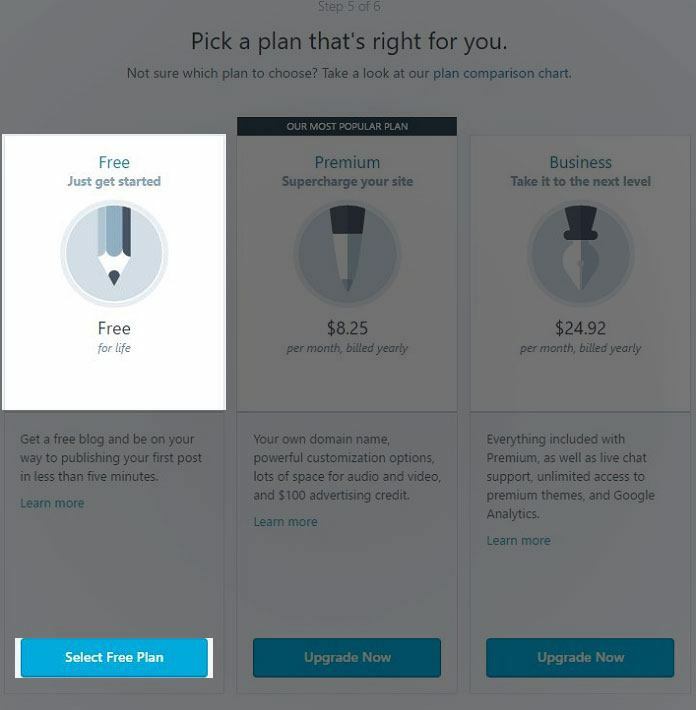 Pick a plan that’s written for you, as we creating a free website, we’ll go with Free plan. You may go with the Premium or Business plans if you need. Create your free WordPress account by filling the form. Provide valid email address. 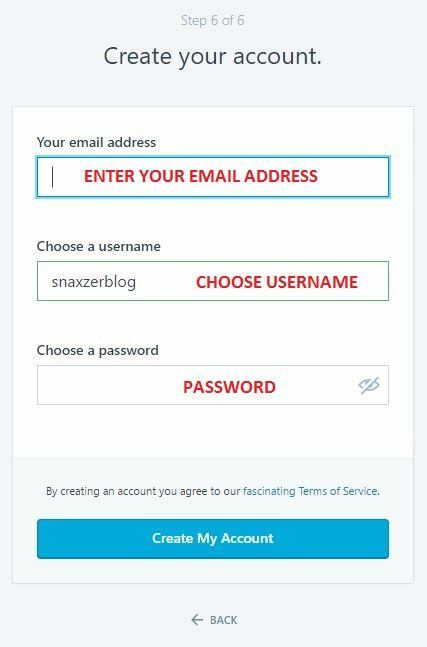 Once you created an account, confirm your email address from your mail inbox. WordPress Dashboard from where you can add a post, plugins, and themes from the sections available in Left side navigation. See the picture bellow. So this is all about the free website and blog. 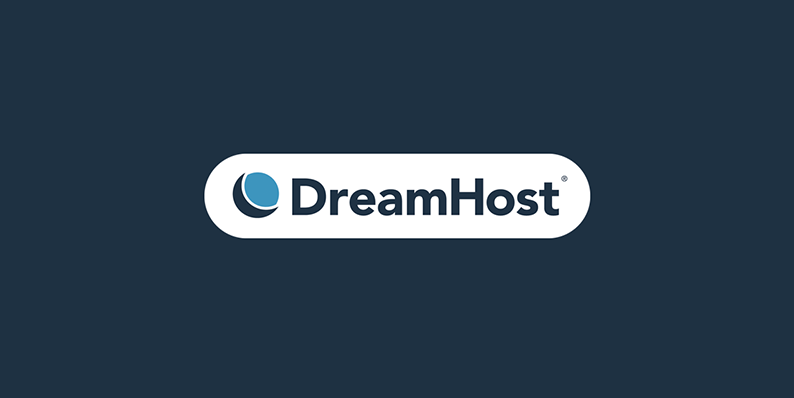 I personally recommend you to have a Self-hosted WordPress site or a blog. If you stuck somewhere while creating your blog, feel free to drop a comment in the comment section. Thank you!! Will learn it during free time and explore talents!! This article is of great help dude!